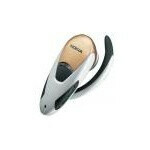 Nokia announced today their new Bluetooth headset - the HDW-2. The headset weights only 25g can has a talk time of 3h and 60h of standby time. It fully supports the v1.1 Bluetooth protocol and Hands free profiles.